The Winter Market - aka the Lexington Farmers Market indoors at Victorian Square -- had even more energy and patrons than I expected Saturday. The aptly named J. Wood, for example, a well-known cut-flower vendor at the outdoor market, brought beautiful wreaths, centerpieces, and "swags" of freshly cut greenery. 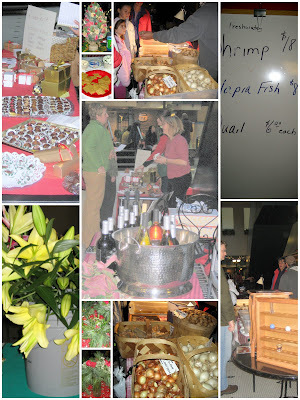 The greens were among several items, not all of them local, that vendors had NOT included in last week's LFM newsletter. Mr. Wood says he will be happy to replicate any holiday greenery from high-end magazines or websites -- just bring him a photo. He will be back at the Market on Saturday, December 20, 2008, or you can call and arrange to go to his place, which he says is eight miles from downtown Lexington on Newtown Pike. Call him at 859.253.2643, or even better, he says, at 859.533.3813. Tech note: With this post I am testing a new photo management system, so please let me know if there are issues with how the photos show up on your computer. In particular, I am not sure how the photos will show up in the email inboxes of those who subscribe to Savoring Kentucky by email -- that's a machine process that I can't preview. So do let me know whether you see problems with today's photo "collage." Thank you!